I have begun an apprenticeship with the khao soi ladies, in which they have kindly allowed me to come and “learn to make khao soi.” From their perspective, this arrangement means that they humor a regular customer, who, in turn, provides them with some amusing distraction from the everyday routine. From my perspective, I pick up some cooking tips—most applicable when one is cooking for hundreds and has a Thai market at one’s disposal—and, like a good anthropologist, get to know that establishment from the inside out. On the first day, I arrived at six in the morning, put on an apron I’d bought the day before at Warorot Market and my complementary Flight of the Gibbons head-kerchief, and was taken in hand by Dai, the sole staff member that speaks any English. Dai is from Phrao, about one hundred miles north-east of here, lives with her mother, is single, and quite content with it. Dai is a very good sport about having me on her hands, and adept at finding things for me to do that would not, from her point of view, either offend or tax me. The delicate balance here is that I am, all at once, a customer and a guest, a student, and a worker: a confluence of categories that confuses all the normal hierarchies. I cannot truly be expected to dry the silverware like one of the lowest-level servers, but that seems to be one of the things I want to do. Plus, of course, with virtually no Thai on my end and almost no English on theirs, we had little capacity to work out this confusion of social categories. They want me to be sabai sabai, and bring me seats and coffee and ice water, but they also know I am there to learn, and understand that I needed to stand up and get my hands dirty to do so. Each morning has been an awkward, friendly dance, eased by my laughing at myself a lot. I’d like to think my willingness to do menial work also helped, but, for all I know, that may proves more embarrassing to them than anything else. In the end, they keep asking if this is sanuk (fun), and as long as I keep assuring them that it is, we are all reasonably easy with each other. My first morning, I was put to work deep-frying Chinese egg noodles. The wok was bigger than my entire stove-top in Worcester, and filled to the brim with oil cloudy with corn-starch. The corn-starch was the biggest cooking take-away tip of the day: before you deep-fry or boil fresh noodles, they must be liberally tossed with it. The dusting in which they are packaged is only sufficient for you to begin your own tossing. (When you boil fresh noodles, you must use two baths of boiling water, one to cook them about half-way through and to rinse off the corn-starch, and the second one to finish the cooking and leave the noodles clean and loose.) Dai was obviously nervous to have me dropping noodles in boiling oil, but seemed reassured that I did know how to stir, spoon, and drain. Everything I did was impassively observed by Noai, a handsome young man with protective tattoos. Noai and Dai actually do all the cooking for the restaurant, beginning at 3 AM. Everything after that is merely assemblage or management. At 3 AM, Noai and Dai are boiling chickens, making broth, chopping green chiles and slicing limes, and deep-frying chicken breasts for khao man gai tawt. The special rice for khao man gai (steamed chicken over rice) and khao man gai tawt (fried chicken) is made as needed over the course of the day, as is the broth for the khao soi. While she’s working with Noai, Dai is also preparing the large breakfast meal for the staff. After my deep-frying lesson, I was allowed to boil fresh egg noodles in two separate baths, joggling them carefully in a deep bamboo straining spoon, and emptying them into a covered bin, where they awaited an order. When they are ordered, they are returned to the boiling water to be freshened up before serving. The next task was the most challenging of the morning: to tie up little bags of the fried noodles for the orders of khao soi taken to go. 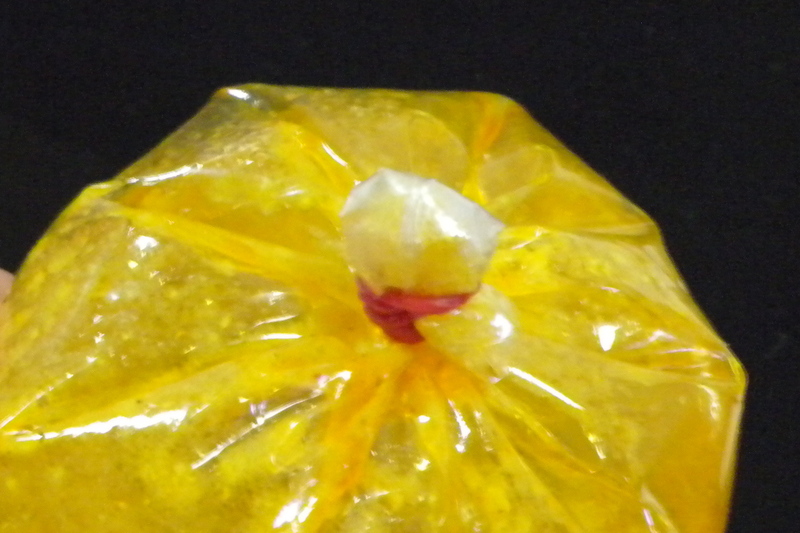 Those of you who have visited Thai markets or food-stalls will be familiar with the vendor’s art of tying up with rubber bands packages of food or liquid, even boiling liquid, into these perfectly sound, air-tight and leak-proof plastic bags. The vendors fold the bag down and then across, and whip the rubber band around the fold one way, then the other, and then pop the rubber band down onto the gathering in a perfectly secure knot. Nothing leaks, ever. I will have to call the woman who supervises the khao soi counter Madam Khao Soi because I am unable to pronounce, much less spell, her name. She’s a kindly, rotund woman of about fifty, illiterate and half-blind, and Pi Aeh has no compunction about making fun of her bad vision. Although this sounds horribly cruel to American readers, Madam Khao Soi is obviously much-beloved by her co-workers, who are only too happy to read something to her as need be. Madam Khao Soi sat me confidently down with a tray of crispy noodles, a pile of tiny plastic bags and rubber bands and expected me to go to it. To her utter shock, I had not only never done this before, but also proved quite helpless at it. No matter what she and Dai did, no matter how many ways and times they showed me, I could not manage it. My big clumsy farang fingers, getting oilier and oilier with the noodles, would drop one end of the rubber band, send it flying across the room, or would manage to tie the knot but not tightly enough to keep the contents air-tight. But I tried, and tried, and tried, laughing all the while both in real amusement at my own ineptness and to assure them that this was sanuk. Finally, they declared me set lau (all done). Later, in one of the many quiet moments, I went off by myself with a few slices of cucumber, a bag, and a rubber band to keep trying. Madam Khao Soi saw me trying again, came over, and showed me in very slow motion, until I finally managed it, to great applause and laughter. I an not, however, permitted to tie up any hot liquids. The meat cleaver is also not going to find its way into my hands any time soon, either. The skinny waitress with the warm smile had arranged two plates of spirit offerings around 6 AM, and set them out on the sidewalk, and then lit incense to the family shrine up in a corner near the ceiling. In the early hours of the morning, only one monk came by, and a couple eating a breakfast of khao man gai bought him a package for his alms bowl and knelt on the sidewalk to receive a lengthy blessing in Pali. The breakfast business my first morning was slow but steady: a family here, an elderly lady next, a mother and child on the way to school. Most were clearly regulars, and all snuck confused glances at the forty-year-old Western woman sitting with the staff, trying to tie noodles into plastic bags. Dai and Waa (Pi Aeh’s niece, whose children go to Prince Royal’s College, and whom I occasionally see on that campus) explained to the breakfast regulars that I was there to learn how to cook and that I didn’t really speak Thai (outside of being able to understand what was being said about me, mostly). These explanations did not seem to clear up the confusion, although it seemed to make the customers more comfortable staring at me. As dishes of sauce and broth are poured for the breakfast regulars, Pi Aeh arrives around 7 AM, greets me with great merriment, and then lights incense and prayed at the three corners of the restaurant. Later in the morning, she lights incense again, and then puts out some chicken bones for the stray dogs. Nobody stops what they were doing or gets quieter while she prayed; they just continue to move and work and talk around her. This is between her and the spirits. Breakfast is served to the staff at around 8 AM: a stir-fry of cauliflower and pork over rice one day, and the next, a very spicy curry of kaffir lime leaves and funky bits of pork. There was general disbelief when I said I would eat the curry (and, by God, I did, politely choking down parts of pig I don’t usually touch), and when I brought my plate back, there was a group inspection, and an amazed consensus: kin lau (she ate it). They were surprised I ate something that spicy, not that I ate intestine, heart, tendon, and what I’m pretty sure was pig genitalia. While the staff were very friendly and warm with each other, bantering and occasionally shoving gently, they are not family, and ate separately from each other, in different places across the establishment. I am not allowed to eat in the back like a servant, and am sent out into the dining area with my plate. Pi Aeh eats at her desk over the accounts. The day I had finally mastered the rubber-band around the plastic bag, I went back into the kitchen to shown Dai, and found her stir-frying an additional breakfast dish for her and Noai of grasshoppers and a scrambled egg. During the khao soi tutorial, Dai took me on her motorbike to the Muang Noi market to buy the ingredients to make the broth for the khao soi. Muang Noi, not much farther from our house than Warorot Market is known as the primary fruit market in town, but the alleys behind the fruit stalls are a wet and steamy maze of vendors catering to restaurants and food vendors. Here were massive tiger prawns, squid, and scallops flown in from the coast, asparagus, bales of mushrooms, barrels of cooking oil and fish sauce and soy sauce. Dai stopped at one store, pointed out the right kind of curry paste for khao soi (alas, unavailable premade in the US), ordered a kilo of it, along with six kilos of coconut milk (much thinner than the coconut cream you get in cans in North America) and then left to purchase some vegetables. When we returned the coconut milk and curry paste were awaiting us in the parking area, tied to her motorbike, with no money changing hands. 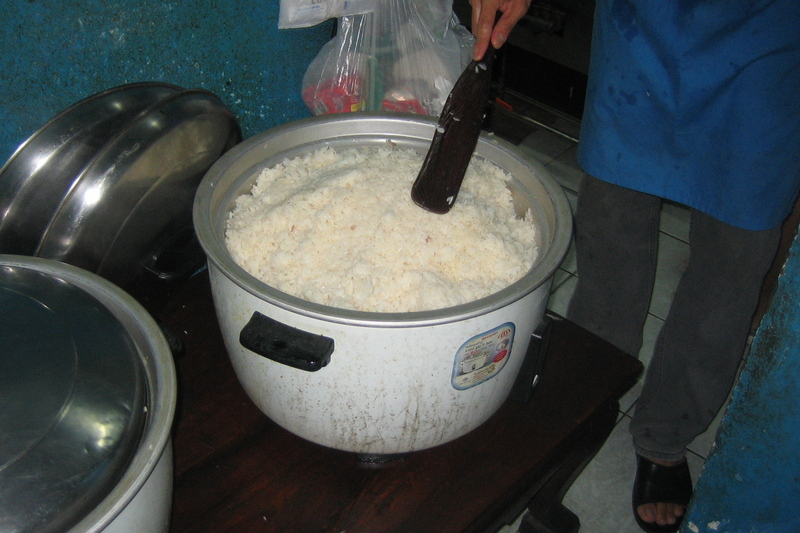 Take one enormous rice steamer-bucket full of water and pour it into the biggest pot. Add to it 100 grams of salt, 350 grams of rock sugar, three cones of palm sugar, and one spoonful of white sugar (but only one, she stresses). Pour into the pot five of your six kilos of coconut milk. Grind up one small blender container of coarsely chopped galangal (no need to peel it) with some water very finely, then pour it into the pot. Add one smallish jar of store-bought dry curry powder. Add one handful of star anise, and turn on the heat. Pour the remaining kilo of coconut milk into a wok and turn the heat on high. Add the kilo of curry paste to the wok (the brick-red one with the short Thai name, she reminds me), and stir. 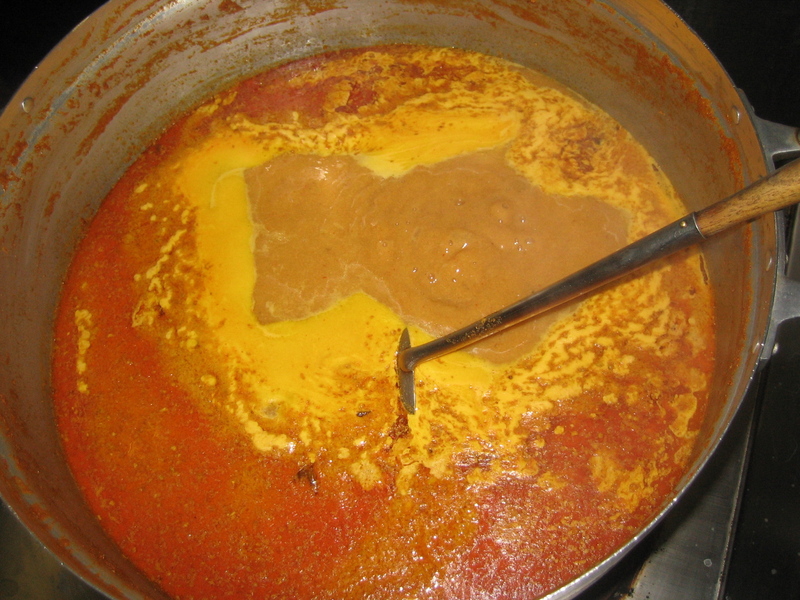 After the curry paste is fully mixed into the coconut milk and has boiled a bit, scrape it into the broth, and stir again. Add as many chicken legs as you think you are going to serve within the next hour, and simmer hard. Just stir any foam back into the broth as needed. It should cook down for about an hour, in time for the lunch rush. Add more chicken legs as needed. 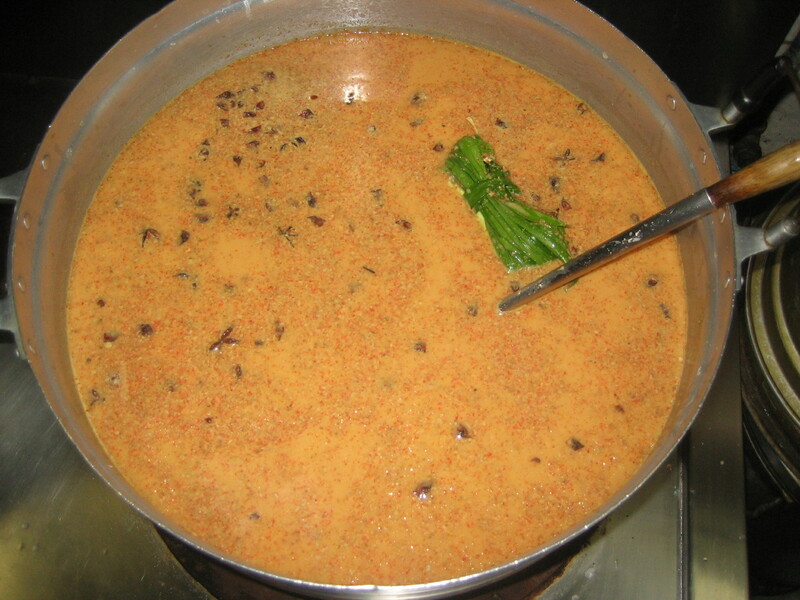 As I stirred the curry paste into the coconut milk, Noai was watching me, and when he couldn’t stand my ineffectiveness any longer, politely took the spoon away from me, and showed me a better method to mix the paste into the milk. The gesture, seeming so ordinary, was of huge significance. I’d proven myself approachable enough that he could overcome his hesitancy about our very different status levels, and he could assume the role of teacher. After that point, he was able to join in laughing at my inability to express myself, and could confidently show me how to manage the ancient and noisy food-processor they use to puree garlic and ginger. Fry three handfuls of shallots and a perfectly-tied bundle of grassy herbs in a wok partially full of oil until the shallots brown. It is the skinny waitress’s job to tie the herbs; no one else does it. 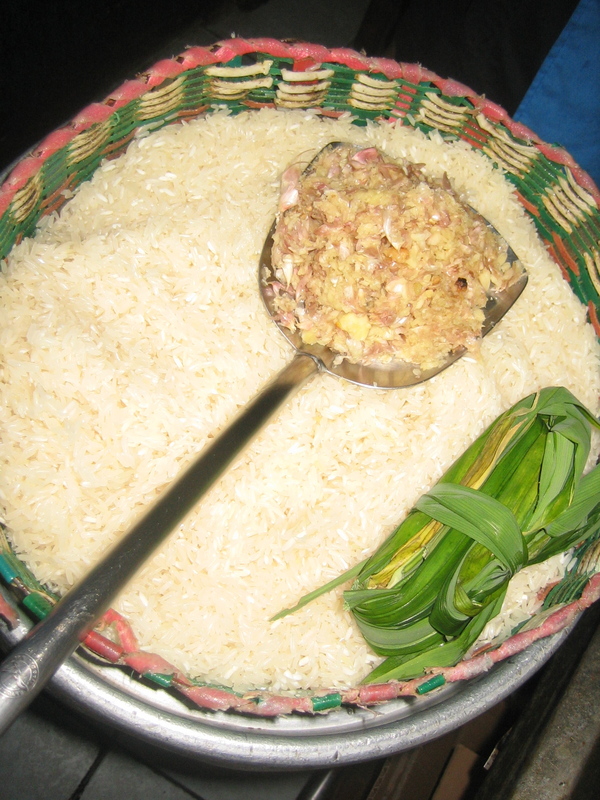 Add a plastic basket of rice, about twelve cups, well-rinsed. Add a whole lot of drinking water and boil it all together until it’s about half-done. Pour another few gallons of rich chicken broth (recipe below) into an enormous rice steamer, stir in the parboiled rice, and steam about twenty minutes. If you have something you want to keep hot for your lunch, you can put it on top of the rice in a plastic bag while it steams. Fluff it with a narrow wooden spatula when it is ready to serve. On the second day, I realized that the word “mali-en” I’d heard the staff saying around me was intended to be my name. Sounding just like a Thai version of “Mary Ann,” it harkened back to a conversation weeks and weeks ago between me, Ken, and Pi Aeh, about how the children had chua len (Thai nicknames) but I did not. Pi Aeh, with typical authority, determined on the spot that my Thai name should be Malee, because it bore some resemblance to “Ju-lee” (all Thais keep the /t/ silent at the end of “Juliet.”). Dai had overheard this conversation, and somehow “Malee” had morphed into “Mali-en.” Things in the kitchen got much easier after I discovered the ability to respond to my own name. Pour off most of the early morning’s batch of chicken broth and use it for khao man gai. Soak and rinse a dozen chickens, with heads and feet attached. Don’t bother to take off the plastic twine from which they were suspended in the wet market; you’ll use that to hang them in the display vitrine. Politely ignore the nonsense Malien is trying to tell you about how chickens don’t have heads in American markets. Add several gallons of drinking water to the chicken broth pot, add about a hundred grams of rock sugar and a cup of salt, and lay in the chickens carefully. On Sunday, firmly in the role of customer and not worker, we took the children to eat khao mon gai tawt for breakfast, and I brought a dozen New Zealand apples, with Ken explaining that in the USA, students bring teachers apples. For the Chinese Fall Festival beginning next week, they will begin to serve vegetarian versions of all their dishes, along with fresh spring rolls and other tofu-based dishes. Now that Dai and I are on arms-around-each-other’s-waist terms, I will come in for a few more early mornings in the steamy kitchen, and see what else I can learn as I smile politely and try not to get in the way too much. I vote first for trying out the coconut rolls. Any sweet roll I consider to be a two-cook process, and I have two ideas for replicating the filling. Not only do your pictures but your words provide me with a visual feast. I am laughing at your comment about trying to convey that the chickens in the USA are not cooked with their heads attached. Can’t wait for some more quiet moments in my life to read more of your adventures. I love that you are having so many wonderful adventures. I can’t wait for you to come home and we’ll see if we can’t make our own versions of these Thai dishes. Great post! Thoroughly enjoyable, of course. how interesting that sugar is added to the water for the chicken broth. when done does the broth taste sweet? A lovely view into life today in CM. Dai’s gesture of feeling comfortable enough to take the spoon was especially touching.